I love it when fashion takes its cues from art. This "artistic" trend has become popular lately with all the prints that feature paint splotches, splashes of color, or broad brushstrokes. 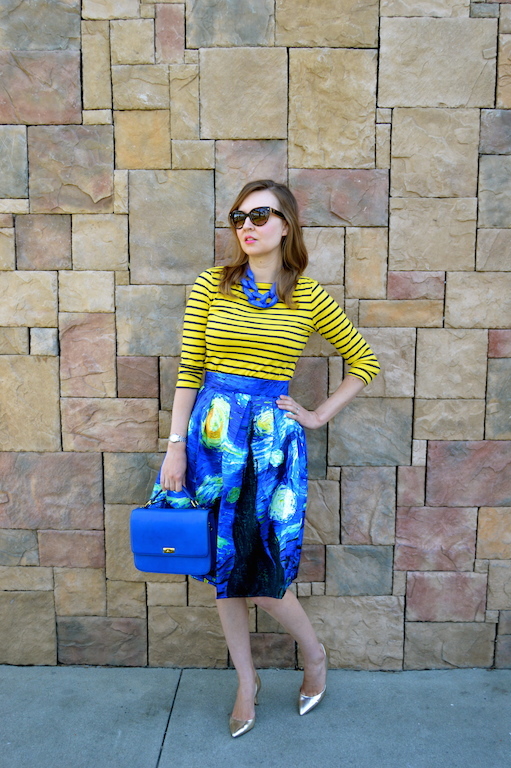 The skirt I have on below from SheIn takes this trend quite literally by emblazoning Vincent van Gogh's famous Starry Night painting on it. I don't think there is any painting that is more recognizable throughout the world than Starry Night. My first time wearing this skirt out only confirmed this as at least a few people stopped to tell me that Starry Night is their favorite painting or that Vincent van Gogh is their favorite artist. 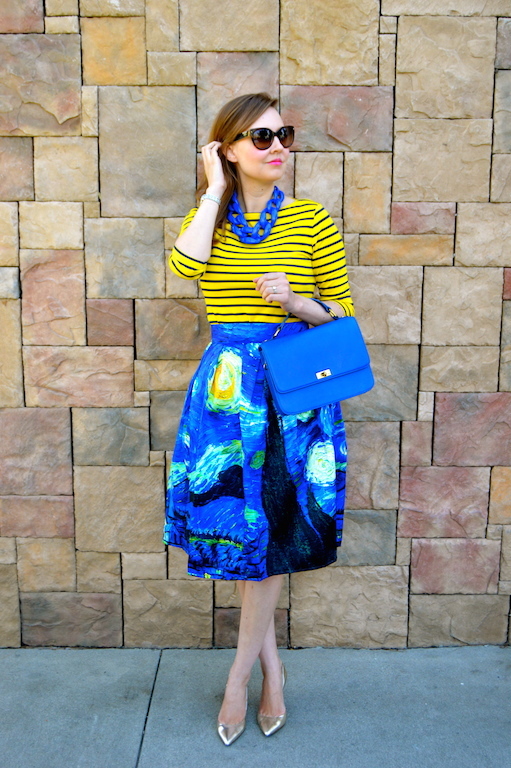 In addition to this skirt featuring Starry Night, SheIn has loads of fantastic skirts that are colorful, whimsical, and feature of variety of unique prints that you can find here. The selection is truly amazing and the price points are even better, with most items retailing for between roughly $20-$30. It's a great way to try something a little different or trendy, without a huge investment at stake. They also have some more basic and classic items for those of you who don't necessarily want to go as far as having a piece of post-impressionist art on your skirt. SheIn truly has something to suit everyone's tastes! Oh how fun! I love that painting and I think I love it in skirt form just as much. 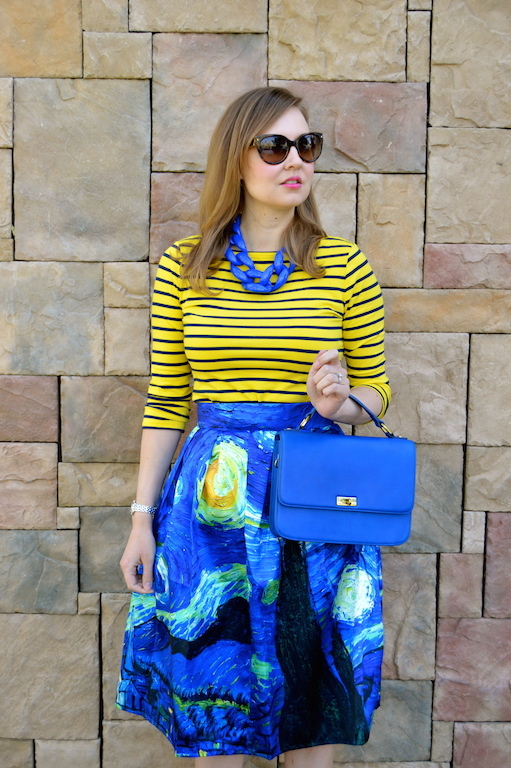 It's perfect with the yellow stripes and bold blue necklace! I love artsy graphic prints too. That skirt is stunning. I must order it. Also, this skirt is 100% you Katie and that is a compliment! And please come link up with me on my very first linkup. This outfit is so gorgeous not to. Thank you. Oh wow, I want that skirt! And your styling to so cool and eye catching. You are the QUEEN of color, my dear! Thanks so much for coming to the Fun Fashion Friday party! This is such a fun look! 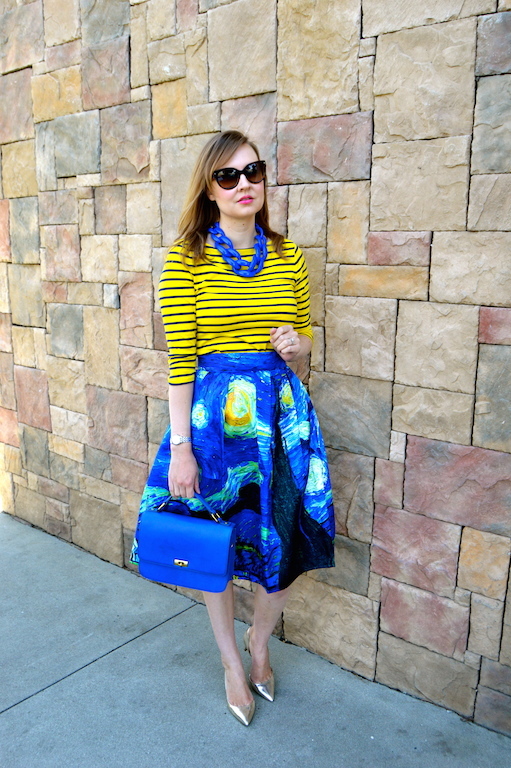 I love Starry Night and that skirt is amazing! Oh, how I Love this! Van Gogh and Starry night are definite favorites of mine. May just have to order this one. :) You have styled it wonderfully with the yellow striped top and gold shoes. Such a fun color combination! It's very fresh and the print combo is so fun. 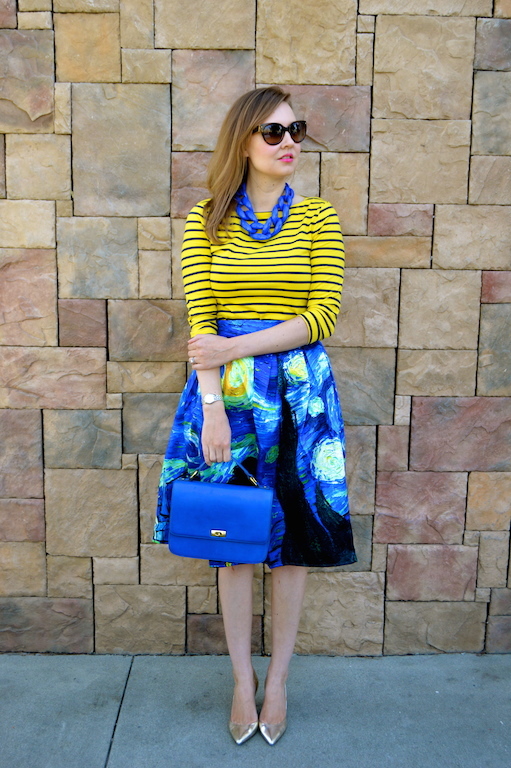 What a fun print and the yellow stripe top is so perfect with it. I love it when fashion and art collide, the results are (almost) always spectacular and unforgettable, as it is in the case of your skirt :) what a picturesque look!! I love that skirt!!! So cute!!! Do you mind me asking what size skirt you ordered from SheIn? They only have small and medium left and a lot of the comments say it runs too small and didn't fit! I am wearing a size medium. I would definitely say that the skirt runs small. I could have easily taken a size large, because even the medium was a bit tight. I hope this helps!